Come join the London Ajax User Group (LAUG) for it's monthly meet-up! This Month we welcome Stefano Solinas and Kornel Lesinski. In this talk, you'll learn the simple API for pushing events from Node or PHP (or any other server) to web browsers. 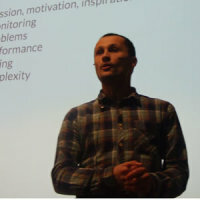 Kornel Lesinski is a London-based web developer who participated in designing the Server-Sent Events specification at the WHATWG.